Bitumen modification unit 4-7 m3/hour production capacity - GlobeCore Bitumen Emulsion. UVB-2 bitumen modification unit is designed for preparation of modified bitumen by introduction of polymers into straight bitumen. This plant is designed for modification of bitumen by adding polymer, adhesion additive and plasticizer to the bitumen. Modified bitumen is used for production of road top layer asphalt, protective layers of concrete buildings and crack sealants, as was discussed in more detail previously. Using the modified bitumen instead of the regular bitumen in asphalt concrete mixes allows to extend the temperature range of the asphalt’s performance in seasonal temperature changes, ensures deformation resistance under traffic loads (rutting and cracking) and increases the overall service life of the road. Virtually any modification recipe can be implemented in the plant, with carious modifiers, such as polymer, wax etc. Modified bitumen is used in road, bridge and overpass construction and repair. The unit is designed for facilities involved in repair and production of asphalt road top, water-proofing of structures and soft roofing. A typical 4-7 cubic meter per hour plant is built on a structural frame, which supports components such as two reactors, mill, components supply assemblies, oil heater and circulation system, computer control panel and a polymer loading platform. 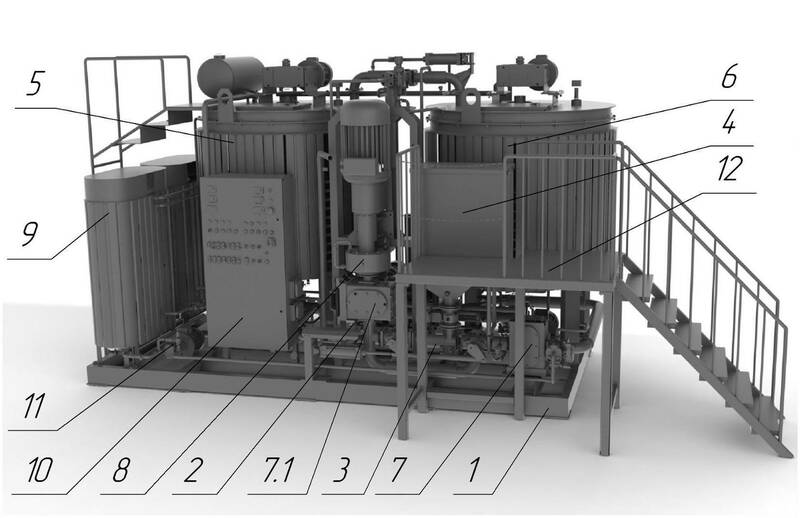 Figure 1 – Bitumen modification general view 1 – frame; 2 – input/output pump (located in the back); 3 – mixer; 4 – polymer input hopper; 5 – reactor No 1; 6 – reactor No 2; 7 – mixer supply pump; 7.1 – mill supply pump; 8 – mill; 9 – heater; 10 – control cabinet; 11 – plasticizer feed assembly; 12 – polymer loading platform The bitumen modification plant is a unit consisting of two reactors, a mill, an oil heater, bitumen supply assembly, control cabinet, polymer feed assembly, electro-pneumatic valves, heating system, adhesion additive feed assembly, plasticizer (oil) feed assembly, and a polymer loading platform. All components of the unit are mounted on steel frame.